We asked about the professional development books you’d recommend to your teacher friends. Here are the six that stood out. In May we used our Facebook and Instagram feeds to ask, “What books would you recommend to your teacher friends this summer?” We expected to round up five to 10 professional development texts pretty quickly, but we weren’t entirely surprised when, with the end of the school year clearly in sight, you suggested a reprieve: “Read for pleasure” won the day, garnering far more mentions and likes than any of the PD books nominated. So we held this list of PD books until the early days of summer had passed—we hope by now you’ve had a moment to take a deep breath, catch some sun, and put the past academic year safely in the rearview mirror. Here are the six PD texts that made our final list, drawn from hundreds of recommendations by educators. Extroversion is overvalued in American culture and overrepresented in positions of power, according to this best-selling 2012 book by Susan Cain. It’s a cultural bias that marginalizes a large segment of the population—one-third to one-half of Americans are introverts—and ignores the powerful traits associated with introversion, such as concentration, listening, caution, and independence. George Couros’s 2015 jeremiad against cultures of compliance within the school system emphasizes empowerment instead, stressing the importance of questioning, creativity, and wonder for students, teachers, and administrators alike. Couros is influential—he has 173,000 followers on Twitter—and his book is a big ask: It summons educators to confront traditional models and perspectives and adopt a mindset that fully embraces transformational change and innovation. Jo Boaler’s 2015 book traces the research behind math anxiety, the crippling response to high-stakes testing and rote mathematical drills that, according to Boaler, follows students from elementary school through adulthood and results in a lifelong fear of the subject. 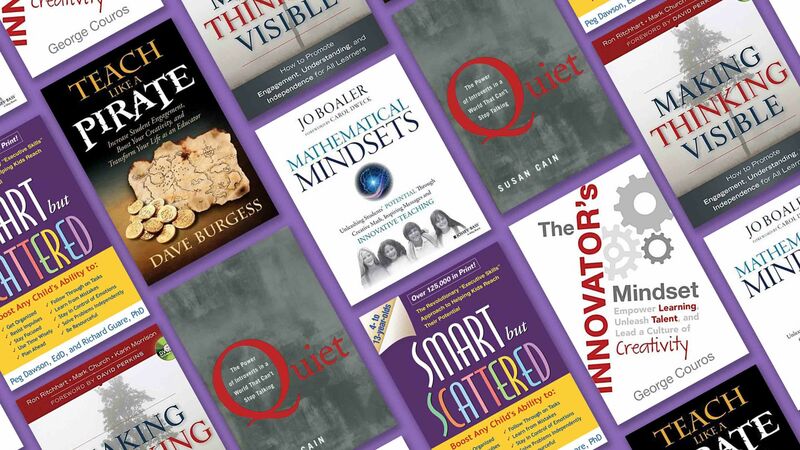 With a forward by Carol Dweck, who popularized the idea of growth mindset, Boaler’s text pairs research insights with practical strategies for building confident, resilient math learners who can help ensure that the U.S. remains competitive in growing fields like computer science, artificial intelligence, and green energy. Five years after it was published, Dave Burgess’s Teach Like a Pirate still figures prominently on lists of must-read PD books for educators. Derived from Burgess’s spirited seminars of the same name, the book urges educators to embrace their passion and actively demonstrate their creativity as a way to drive student engagement. The book’s focus on teacher autonomy and creative license is a stiff rebuke to the troubling overemphasis on standardized testing and rote memorization in schools, a perspective that may frustrate some readers—while inspiring many others. A practical approach to helping children between the ages of 4 and 13 who struggle with executive functions, the fundamental skills that govern things like impulse control, focus, and organization. Authored by Peg Dawson and Richard Guare—psychologists at the Center for Learning and Attention Disorders in Portsmouth, New Hampshire—this 2009 book provides rubrics to determine a child’s areas of strength and weakness, and offers strategies, worksheets, and activities to boost self-control. Dawson and Guare also address older kids: Smart but Scattered Teens came out in 2012. A well-organized, research-based guide for teachers who hope to move beyond test scores to meaningful lessons that support higher-level thinking. Published in 2011, this book by Ron Ritchhart, Mark Church, and Karin Morrison provides dozens of practices and learning routines for K–12 classes that are designed to deepen comprehension. The book’s structure is of particular value: The thinking routines are broken down into easily digestible categories like purpose, execution, classroom examples, and assessment.